The Ultimate Charity Auction, which ends at 4pm on Wednesday 13th December, has attracted glittering prizes from household names in sport, celebrity and lifestyle. Among the perfect presents and money-can’t-buy experiences is a chance to own a rare collection of Beatles images donated by renowned photographer Tom Murray. 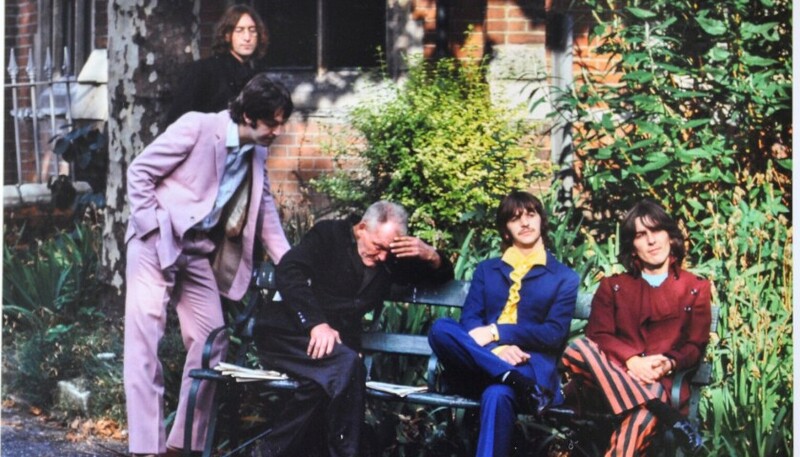 Included in the imagery is a photo entitled ‘Nowhere Man’ which captures a gentleman asleep on a bench, unaware that he is surrounded by – and then photographed with – the Beatles. Tom, who took the photo as part of his ‘Mad Day Out’ series of Beatles images in the summer of 1968, explained: “We were taking photos in the park near St Pancras Station when we came across this man asleep. “The boys were all in a great mood and thought it would be funny to stage this photo without ever waking him up. The photographs are considered by experts to be the very best colour images from that day with the set completed by ‘Martha My Dear’, ‘Flower Power 2’, Ready, Steady, Go’ and ‘Untitled 2’. Tom, then 25 years old, was given an assignment to spend a day snapping the Beatles while working at the Sunday Times Magazine. Dubbed a ‘Mad Day Out’, the photos have become iconic music memorabilia as well as subsequently raising more than £1.4 million for national and local charities with various prints from the day auctioned and donated. The Ultimate Charity Auction has raised more than £980,000 for national and local charities since it was launched in 2012. This year’s star items also include a meet-and-greet with Sir Alex Ferguson in his private lounge at Old Trafford, a chance to star in the next instalment of Football Manager or to record your own single in a renowned Buckinghamshire recording studio. Other fantastic include front row seats and lunch with Jeremy Kyle, a VIP experience for four people at the Badminton Horse Trials and a Sky Sports Gillette Soccer Saturday experience. This year, the beneficiaries of the Ultimate Charity Auction will be the League Manager Association Charity – In The Game, and the GeeWizz charitable foundation, headed by veteran fundraiser and auction founder Gina Long MBE. In particular, the auction will support those battling mental health problems in football and, through GeeWizz, young people and families living with a disability or cancer. “We are on course for another fantastic auction raising thousands of pounds for some very worthwhile causes.